We had the greatest honor of being a part of Sarah and Min's wedding at Camp Puh Tok in Maryland. Picture this-- a whole bunch of your friends and family camping in log cabins, drinking hot cocoa by the fire, and playing kickball in the field before your wedding ceremony. Every little detail was so thoughtfully planned out and personal. Hope you enjoy them as much as we did! "I cannot say enough positive things about BDK Mint! Everything was set up beautifully! Jessica was so accommodating and helpful. My husband is Korean, but I am not, and she was able to blend the ceremony with Korean and English explanations. She also helped me translate my korean invitations! I could not have selected a better company to work with - I only wish I could do it all over again with them! I also got my hanbok from BDK Mint and it turned out amazing. I felt cared for each step of the way. They even recommended places to eat when we visited their shop from out of town! I really enjoyed working with the Jessica and her team. Thank you!!" We had the greatest honor of hosting the Paebaek ceremony for Annie and Pete last fall. 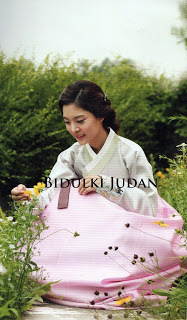 The beautiful hanboks adorned by the mothers are custom-made hanboks from yours truly. Thank you for letting us be a part of your big day! 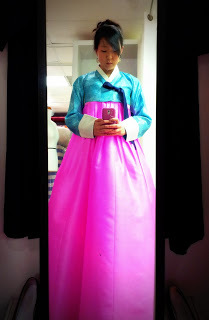 Last week we spoke about how one of our clients switched up her hanbok dress (chi-ma) to wear to two different events. This week we're showing you just one example of how to wear one dress with multiple tops (juh-go-ri) to create a new look. When you wear a juh-go-ri, the look is more traditional, but come reception time, simply remove the juh-go-ri and switch it out for a bolero, and you're ready to party! 1. 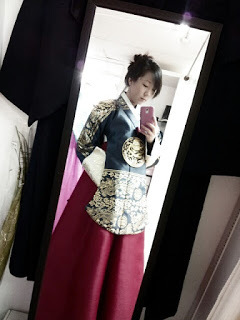 This seemingly normal traditional hanbok is actually a modern hanbok in disguise. 2. This is how it looks with the juh-go-ri. 3. 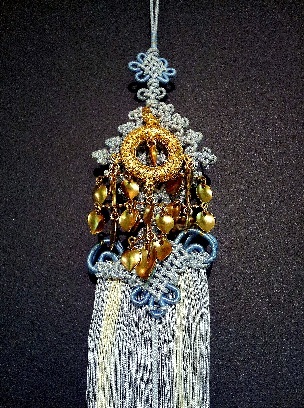 The juh-go-ri is completed with gyut-mah-gi (곁마기) which gives a thinner silhouette. 4. You can see that the mal-gi (the embroidered part of the chima) is slightly showing. 5. 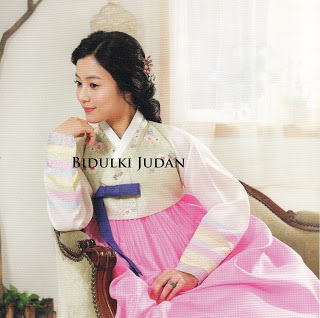 When you change out of the juh-go-ri, this seemingly traditional style hanbok becomes a modern hanbok. One of our lovely clients has shared with us some photos from her daughter's wedding this past weekend - "Please feel free to share my photos as I have received so many compliments about my hanbok! ...My daughter continually told me how beautiful I looked." So we couldn't wait to share it with you! 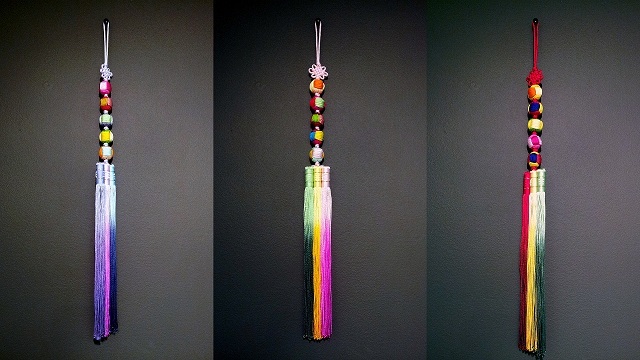 The first photo is a shot of the hanbok from our showroom followed by photos from our client. This mother is one of our repeat clients who decided to use her chi-ma (dress) from her son's wedding last year and combine it with a new juh-go-ri for her daughter's wedding this year. 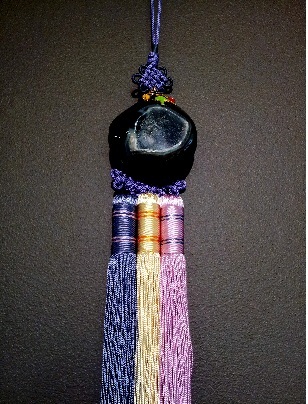 Her chi-ma is made of the high grade silk called "myoung-ju". Myoung-ju provides a beautiful shine. Her juh-go-ri (top) is made of high grade silk completed with myoung-ju sleeve cuffs. Often times, many think that the more embroideries there are, the better, but simplicity also has its own luxurious appeal. Our hanboks come complete with a matching handbag. We must say that the best part of this job is exactly this.. when client's leave our shop happy and satisfied. 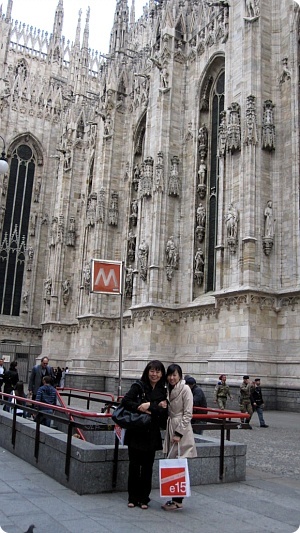 Thank you for sharing your photos with us! Seeing two cultures blended into one at a wedding is such a beautiful sight and experience. Take a look into the Indian wedding ceremony and Paebaek for Bo and Anand at the Penn Museum in Philadelphia, PA. The mother of the bride is in the traditional hanbok (custom handmade hanbok by BDK MINT), bride and groom are in the traditional Indian garb. 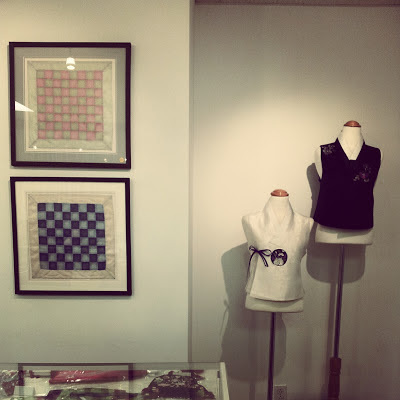 Our Paebaek set up at the Penn Museum... it almost looks like a part of the exhibit! 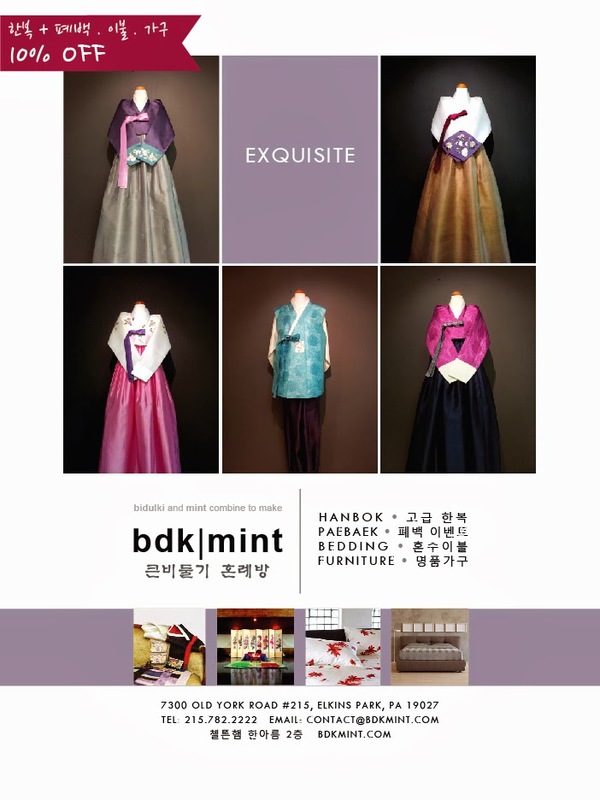 Bdk | mint recently had the opportunity to experience our first ever hanbok photo shoot. To welcome in the cooler weather, designer and owner of bdk | mint, Kim Jeoung Eun, embraces the season with beautiful hanboks featuring the colors and motifs of fall. 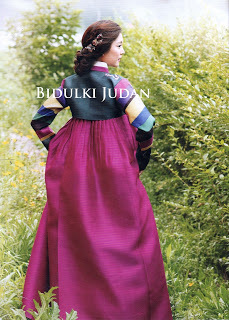 This beautiful women's hanbok (above) is made of 100% silk fabrics. Free flowing panels of different colors make up the dress and the sheer top features the current trend of placing embroidered patches onto the juh-go-ri. 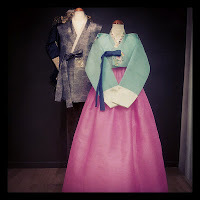 The more classic style hanbok above features a longer jacket called dang-ee. 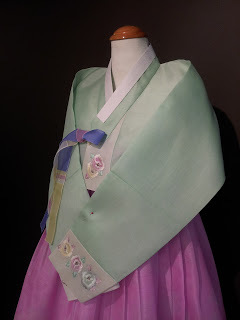 The hanbok is decorated by silver stampings on both the dang-ee and bottom of the dress. The dangee has additional silver embroidery patches on both shoulders, front, and back. This dress also has the varying colored panels covered with a sheer gray fabric for a subtle pop of color. The men's hanbok, pictured above, consists of three parts: juh-go-ri, pants, and the vest. The vest has patches of embroidery on the front and back. 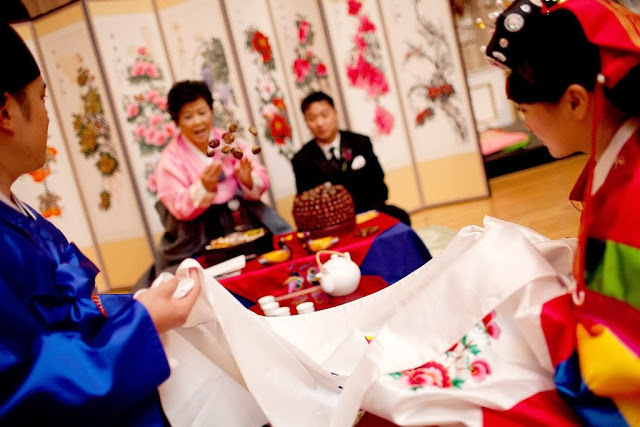 Today, we are sharing how to properly tie the hanbok bow. 1. Take the shorter bow and place it on top of the longer bow. 입어서 오른쪽 짧은 고름을 위로 올린다. 2. Pull the shorter bow through the loop. 걸친 짧은 고름을 긴 고름 밑으로 넣어 위로 감아 빼낸다. 3. Take the longer bow and make a half ribbon shape . Place the shorter bow on top. Pull the shorter tie through the loop. 아래쪽 긴 고름으로 반리본 모양을 만든 뒤, 위쪽의 짧은 고름을 밑으로 한다. 왼손으로는 긴고름을 잡고 오른 손으로는 짧은 고름을 밑으로 넣어 위로 잡아 뺀다. 4. Tighten by pulling the back of the bow. 아래 위로 가볍게 잡아 당기면서 완성된 마양을 만든다. More videos and tutorials on how to properly wear a hanbok coming soon! 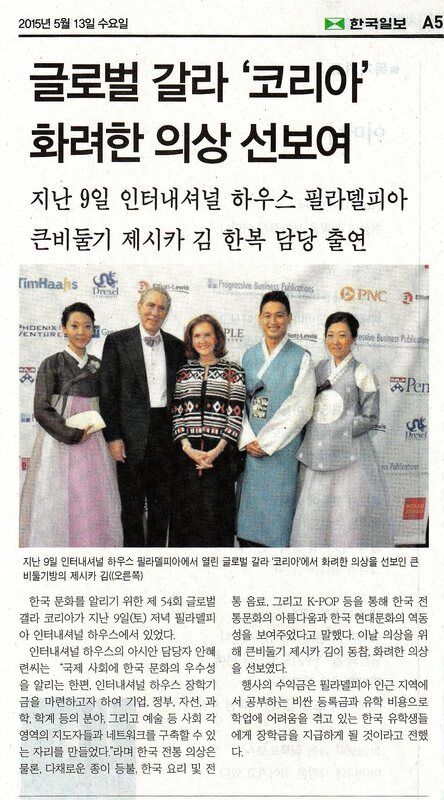 We had the honor of being a part of the International House Philadelphia's 54th Annual Global Gala: Korea. We were able to show our beautiful Korean heritage with our hanboks. The gala was covered by CBS, Philly.com, and PhillyMag.com. 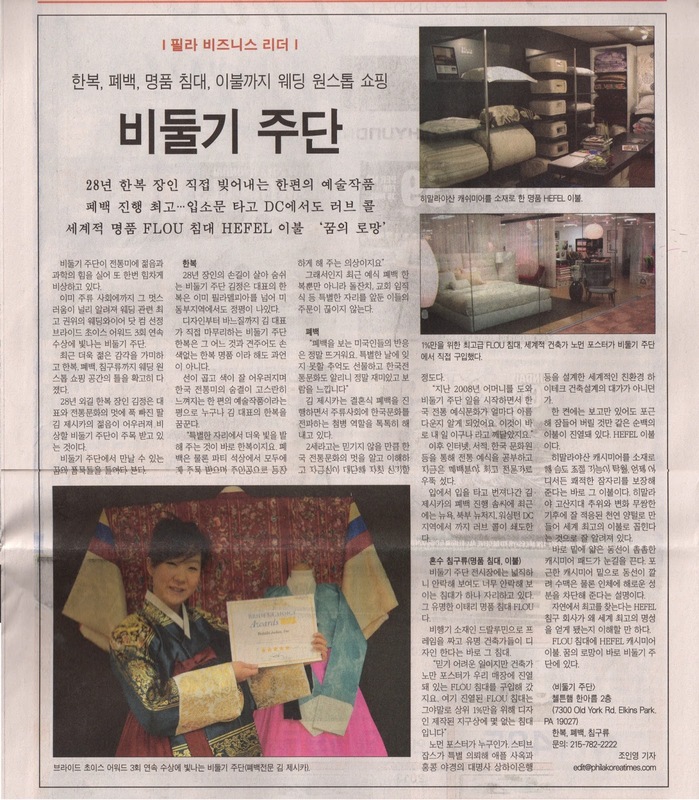 Below is the coverage in Philadelphia's Korea Times (한국일보). Huge thank you to our President/Chief Designer, hanbok models and all of the staff at IHP for making this possible. Elkins Park, PA–January 22, 2014– WeddingWire, the nation's leading online wedding marketplace, named Bidulki Judan, Inc. as a winner of the prestigious WeddingWire Couples' Choice Awards™ 2014! While many industry award winners are selected by the host organization, the WeddingWire Couples' Choice Awards™ winners are determined solely based on reviews from real newlyweds and their experiences working with Bidulki Judan, Inc. Award-winning vendors are distinguished for the quality, quantity, consistency and timeliness of the reviews they have received from their past clients. "There's no better way to start the year than by honoring the hard work, commitment and success of the top-rated wedding professionals within the WeddingWire Network," said Timothy Chi, CEO, WeddingWire. "It is exciting to celebrate a sixth year recognizing businesses whose clients believe they are committed to quality, professionalism and all around top-notch service. We are honored to recognize Bidulki Judan, Inc. for their impressive achievements within the wedding industry." As a Couples' Choice Awards™ winner, Bidulki Judan, Inc. is highlighted within the WeddingWire Network, which is comprised of over 200,000 wedding professionals throughout North America and abroad. Bidulki Judan, Inc. is proud to be one of the top professionals in the WeddingWire Network, which includes leading wedding sites such as WeddingWire, Project Wedding, Brides.com, Martha Stewart Weddings, and Weddingbee. We would like to thank our past clients for taking the time to review our business on WeddingWire. We value all of our clients and truly appreciate the positive feedback that helped us earn the WeddingWire Couples' Choice Awards™ 2014. 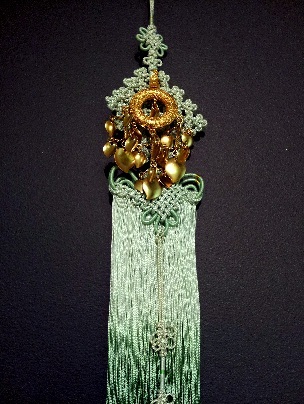 For more information about Bidulki Judan, Inc., please visit our WeddingWire Storefront today at http://www.weddingwire.com/bdkmint. Real Clients 12/2011 at Ballroom at the Ben, Philadelphia, PA. Photo by Ethan Yang Photography. Often times, we are asked, "Isn't the Paebaek only for the groom's side of the family?" In doing so, many of the bride's family members will opt out of participating in the ceremony. Yes, the Paebaek was traditionally only with the groom's family but NOT because the bride is not as "valued" for being a female or that the bride's side is not as respected. All of this is false! Traditionally, centuries ago, the groom would travel to the bride's hometown where the wedding ceremony would take place. All of the towns people were invited to eat and celebrate. The day after the wedding ceremony, the couple would travel to the groom's home to give the first formal introduction of the bride into the groom's family. THIS is the reason why only the groom's family was the only members present. 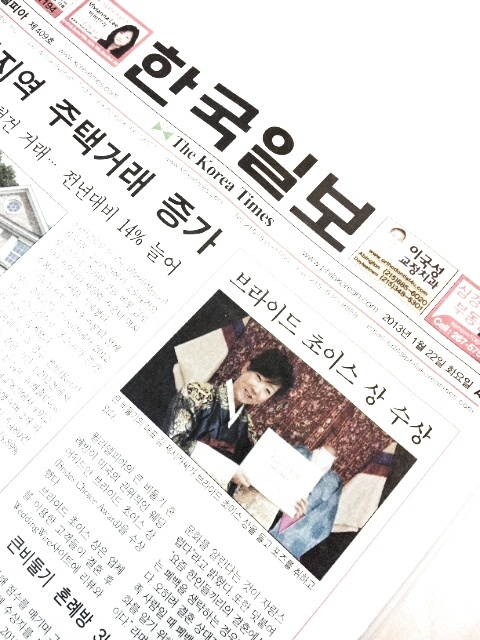 Nowadays, we use the Paebaek to honor our culture and our families, especially our parents! On this Tuesday morning, I was very humbled to find my interview yesterday on the front page of The Korea Times. I cannot believe that it is already my fifth year in the family business and yet it still feels new to me everyday! I am ready to take on future joys and challenges with eagerness and enthusiasm! I am thrilled to see the positive reactions from our clients. Without the support of our amazing clients, we would not be standing where we are today. Thank you, thank you, and thank you again! We bow our heads in gratitude for the past 28 years of business. 앞으로 더욱더 열심히 하겠습니다! I think I put on 10 different hanboks today. Not that I am anywhere close to getting married (a boyfriend is probably the best first step towards this! haha) but when I do, I am probably going to have to change outfits 10 times to feel completely satisfied. 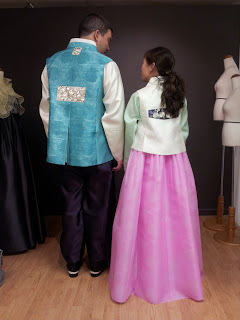 There are so many pretty color combinations and designs and I can't wait to dress my girls up in their hanbok dresses! Going to eat dinner with one of my closest friends ever! Enjoy the rest of your evening! ELKINS PARK, PA – January 13, 2013 – WeddingWire, the nation's leading online wedding marketplace, is thrilled to announce that Bidulki Judan, Inc. has been selected as a winner of the prestigious WeddingWire Bride’s Choice Awards™ 2013! The esteemed annual awards program recognizes the top five percent of wedding professionals in theWeddingWire Network who demonstrate excellence in quality, service, responsiveness and professionalism. Bidulki Judan’s selection as a Bride’s Choice Award 2013 winner was selected based on the positive experiences expressed by past clients on WeddingWire, the world’s largest wedding review site with over one million reviews. While many industry awards are given by the host organization, the WeddingWire Bride’s Choice Awards™ winners are determined solely based on reviews from real newlyweds and their experiences working with Bidulki Judan. 20 service categories, from wedding venues to wedding photographers, based on professional achievements from the previous year. Award-winning vendors are distinguished for the quality, quantity, consistency and timeliness of the reviews they have received from their past clients. As a Bride’s Choice Awards winner, Bidulki Judan is highlighted within the WeddingWire Network, which is comprised of over 200,000 wedding professionals throughout the United States, Canada and abroad. Bidulki Judan is thrilled to be one of the top in the WeddingWire Network of sites, which include leading wedding sites such as WeddingWire, Project Wedding, Brides.com, Martha Stewart Weddings, and Weddingbee. We would like to thank our past clients for taking the time to review our business on WeddingWire. We value all of our clients and truly appreciate the positive feedback that helped us earn the WeddingWire Bride’s Choice Awards™ for 2013. 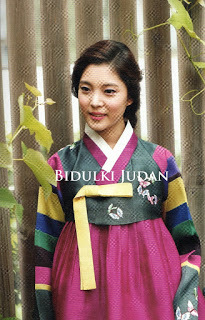 For more information about Bidulki Judan, please visit our WeddingWire Storefront today at http://www.weddingwire.com/bdkmint. Many brides prefer the more plainer designs than the striped sleeves, however the striped sleeve shows off your youthfulness. Each color is a different fabric put together by hand. It is definitely a luxurious piece that most overlook. There are more modern variations for which our company is well known. We keep the traditional line of the hanbok (considering the trends) with modern color variations to create our exquisite hanboks. 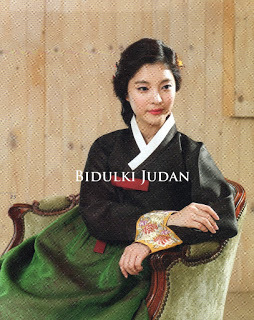 Jeoung is our chief designer and founder of Bidulki Judan here in the States. Originally, she had planned on attending F.I.T. in 1984 to continue her education in fashion. Right before the start of the semester, she discovered she was pregnant and reluctantly resigned from going back to school. After having seen hanbok being made a million times while living in Korea (the hanbok industry had been in the family for over 30 years at that time), she decided that she would try to make her own. Since that day, she started making and selling hanboks from home. She says, "Look at all of the fabrics. 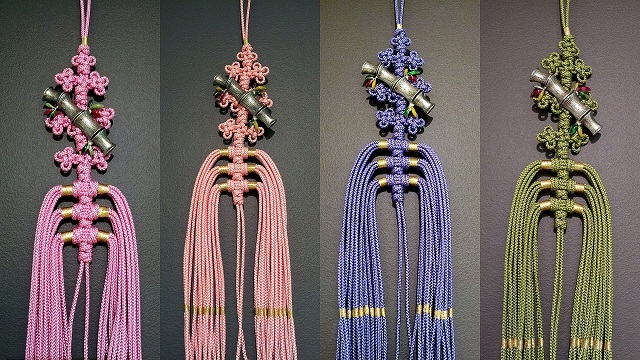 The colors are breathtakingly beautiful and the fact that I can design and create a beautiful hanbok is what allows me to carry through with this hobby for this long. This business is not one that you can do solely looking at money, you need to have the passion and love for the art of creating beautiful things." 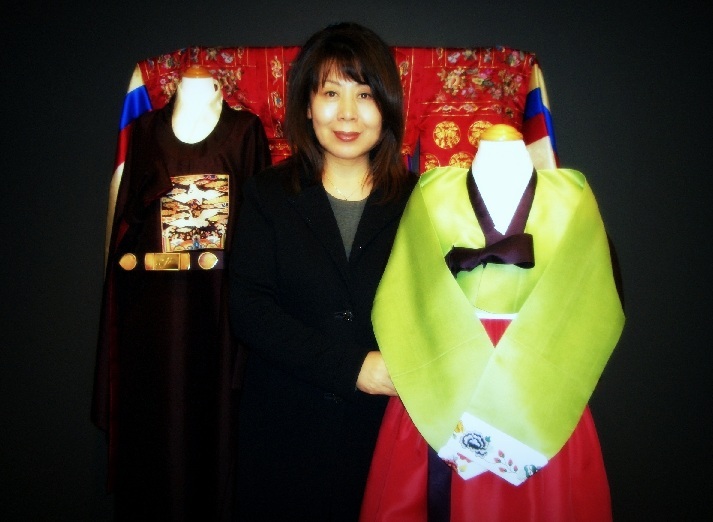 Since our opening day in 1985, she has created an amazing 4,000+ hanboks! This would not have been possible without the love and support of our clients. We love all of our clients. Thank you! 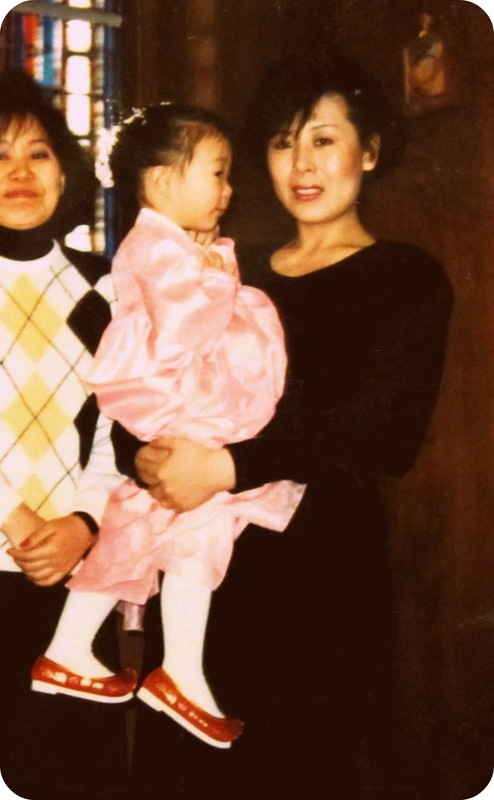 Owner/chief designer with daughter, Jessica Kim (Vice President), circa 1987. I applaud my mother for all of her hard work and am so proud of her. I love you, Mom!